With the launching of a mega bookstore on a space about 5,000 square feet on the 7th floor of the Bishwo Shahitto Kendro Building in Banglamotor, Batighar created quite a stir among booklovers in Dhaka. Designed in the Mughal architectural style, especially like Lalbagh Fort, the superstore has over 1 lakh books of more than 10,000 writers on over one hundred topics. It offers a special section for children and has ample sitting arrangements for readers and visitors. One of its most exciting features is – visitors are allowed to read as many books they like for as long as they wish. Starting from contemporary novel, classics, poetry, translation, biography, short stories and what not, the super shop provides a good array of choice to be indulged with. Depending on the sector the racks are tagged with the label of related subject such as literature, philosophy, Fiction, Science, Business etc. To add a cherry on the top books are also categorized under the publication as well. All the famous publications named as UPL, BSK, Oitijhho, Bengla Foundation, Onnoprakash etc. are racked with not only most cited books but also with the newest one. In one sentence, Baatighar designed the manual search engine in a elucidate way that works most effectively making the search less wobbly. The undoubted unique feature that makes baatighar most shining is their larger than life maneuver of doing business. Rather embracing the trendy entrepreneurial mechanism, Baatighar’s owner Dipankar Das wanted to illuminate the soul with knowledge. Probably this is the only place in town where seller offers you to read as much as you want sitting on the spacious space of the store. This approach keeps me wondering about the Banglabazar and Nilkhet, most popular destination for bookworms, where you can barely stand and reading a book sitting or even standing would be a far cry. And this new phenomenon is very likely to be incepted from Dipankar Das who was a coordinator of Mobile Library Project of Bishwa Shahitto Kendro. In bookstores of Dhaka what I really miss most is the scarcity of books for children. All we are left with the option of waiting for the ekushey book fair to pick amongst a large collection of children books. Now Baatighar offers a good array of child book collections. The ambience that has been followed here is enough to get a good hang of world of imagination through fairy tales, short stories, plays, fables and folklore. And if the parents of peripatetic choosy kids are thinking of what to do, all they need is to rush for the beautifully adorned coffee corner with a book. If you are a glutton you might be disappointed but if you prefer to be bookworm then it’s your heaven. As the name suggests, Baatighar attracts people of all kinds, all ages. Despite the literature adda or seminar, Baatighar has become a rendezvous place in Chittagong and Dhaka where people gather around in quest of pure entertainment. All those who stepped into this Baatighar unanimously acclaimed highly its spacious kind and diverse collection of books, both in Bangla and English. 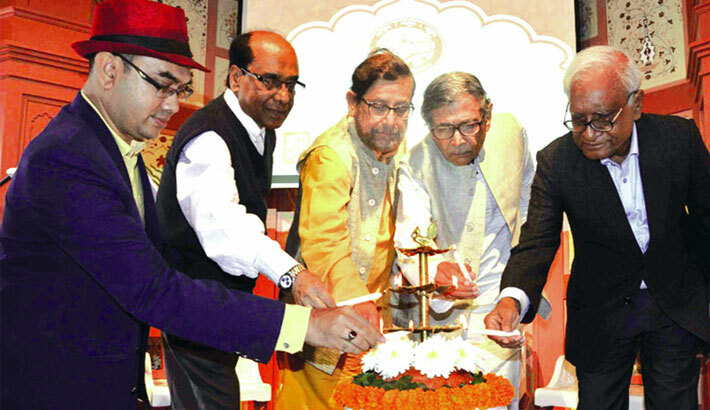 At the launching ceremony of the bookstore on December 29, Cultural Affairs Minister Asaduzzaman Noor attended as the chief guest while Biswa Sahitya Kendra Chairman Prof Abdullah Abu Sayeed presided over the programme. Prof Anisuzzaman, eminent educationist Sirajul Islam Chowdhury and Bangla Academy Director General Shamsuzzaman Khan attended as special guests. Poet Mohammad Rafique, Ali Imam, Mamunur Rashid and Anwara Syed Haq, among others, were also present. So, you are welcomed to Baatighar to get a thrill of getting in touch with books. Expectedly, if you are a book lover, you will get a redefinition of happiness.